When meteorologists refer to "slight risk" and "moderate risk" when talking about severe weather, what do those terms mean? ATLANTA -- With severe weather season now bearing down on us, now is a good time to brush up on how meteorologists measure how powerful such storms can become. When discussing severe thunderstorms across the nation, you will hear the 11Alive Storm Trackers refer to convective outlooks from the National Weather Service's Storm Prediction Center in Norman, OK. 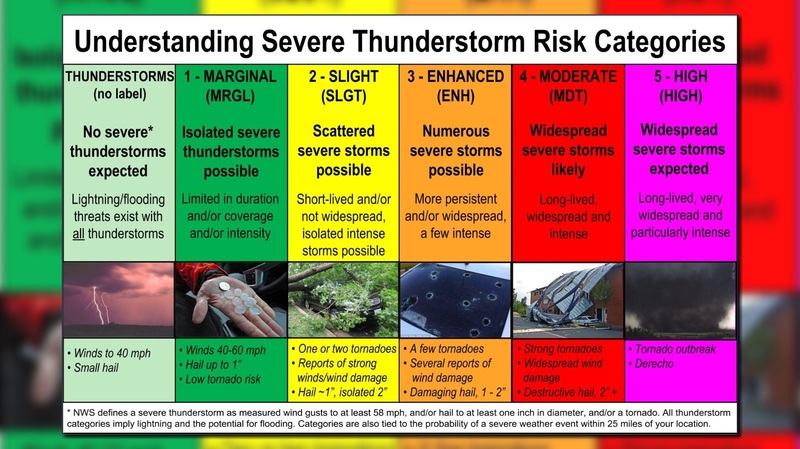 They issue these outlooks on an ongoing basis using a sliding scale of categories of risk for severe weather. But what about those risk categories? What defines the difference between a "marginal" risk and a level just a step up? When you look at a TV map or one produced by the Storm Prediction Center, see if your area is outlined by one of these risks. If you happen to be in an area, know there is the potential for severe weather within 25 miles of your location. ► Get real-time breaking news and severe weather updates. Download the 11Alive app now. A marginal risk means isolated severe storms are possible, with the threat of isolated damaging winds, small hail and maybe a tornado. A slight risk ramps up the probability, with more storm reports. The enhanced risk notes more numerous or widespread severe storms -- some of those can be intense. Moderate and high risks are issued less infrequently as these are reserved for the most intense severe-weather events. Except long-lived storms, including a tornado outbreak or a derecho, which is a meteorological term for a line of intense, fast-moving thunderstorms with destructive winds. Let these categories be your guide. The 11Alive StormTrackers will have ongoing updates every day and be your guide for severe weather across metro Atlanta and all of Georgia.